Add innovative shape and style to your garden with the Heartwood Vintage Shed Bird House. The unique design and contrasting materials on this piece bring an exciting look to your setting in moments. The tall home immediately captures the eye, while offering plenty of room for your avian friends. A 1.25" diameter entrance hole rests at the front of the item, surrounded by a significant piece of wood. This lengthens the entrance, helping to guard nestlings from predators. A gap on the base allows any water to drain from the nest, and a ventilation slot on one side helps the internal temperature stay regulated. The tall, steeply pitched roof brings extra living space to the birds. The wooden construction and mottled finish on the roost enhance the aged appeal, and the silver colored metal roof furthers the antique effect. An outcropping on the extended side of the roof lends more design and fun shape to the piece, and the large black hanger allows it to be hung. 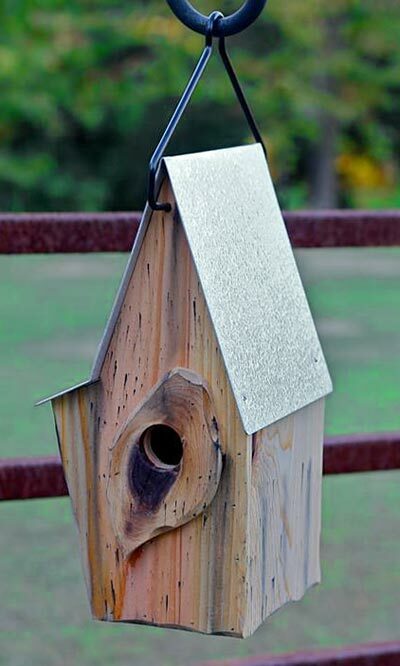 Remove the silver colored metal cleanout panel on the back of this home for seasonal nest checks and cleanings. Offer birds a unique and exciting home in your yard with this Vintage Shed Bird House. Made in the USA. Note: Due to the natural materials used on this home, the wood around the entry hole may vary.